Snow continues to fall lightly throughout the night and into this morning. Total accumulation by my local measurement (a tape measure of the snow on the porch) was about 10 cm. Mostly light, fluffy snow, not the hard, wet snow that's hard to move. 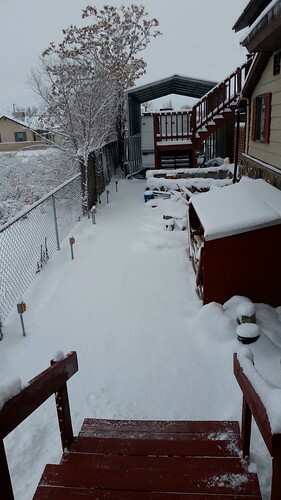 After pushing snow off the porch with the broom this morning, this was the prospect ahead of me. 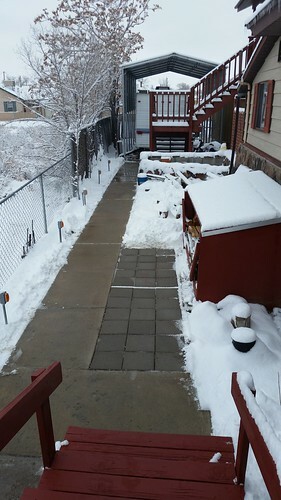 After lunch and much use of brooms and shovels, I got the snow off the sidewalks and they mostly dried out well. I wanted to get this cleared as soon as I could because otherwise it was likely to turn to ice overnight. Lisa said that she couldn't think of any reason to get out of the house today, and I agreed with her.